Rita can go jump off a cliff sha! Ini is too much! Such poice and grace! I like her style... such a classy person. Yes dear, thats the way to respond to evil rumours! ujunwa u re not ini & cant be ini even in ur next world, HATER. Go ini, congrats its not easy even yhough it is a day award. Who should we believe? Linda oya judge. Intelligent response. She didn't even reply any of the people who tweeted crap @ her. Way to go Ini! Ini Meeny Miny Moe Edo, what you did was very un-islamic, haram, un-halal, very porkish and a very infidel behaviour. Walai talai, thank Jesus Christ (Peace Be Upon Him) that you are not in Sokoto right now. I would have pronounced fatwa on you, prohibit your fingers from ever using the internet and forced you to wear (islamic) balaclava in public. Smh. @Ujunwa, i dey smell jealousy from dat ya comment. Ini said she begged her fans to vote for her which they did. Abi na wetin u want make she talk again nah. What i liked abt her comment was dat she made it simple and concise and didn't follow Stella exchange words. Some other wack girl in the industry would av escalate this and turn it to a war. Abeg free her o, no need to cry over split milk. In short, stop hating. nigerian celebrities has a big problem. what makes them think ini cannot have 6000 votes? oga ooo.. it it was genevive them go say u go girl..mchew!!! Drama unfoldin.....battle of nollywood actresses.....abeg mak dem free d babe jor....weda she rig or nt no b her fault na jus naija way....na 2dy?! I really like the way she reacted. Not even a hint of poison or malice towards Rita or Stella.. Good for her. sheikh gbo gbo.... hmmn so na u dey boko haram people for abj and other parts of naija? mind urself oo and that ur sharia nonsense. that's why i love u ini :* dont mind them oo, jealousy no go kill them. She has shown dat, she far more matured dan rita n stella. Babe let dem jump in d river,if dey like. U r beta. I dnt like that stella girl.. Her own is too much! Go and sit down girl.. stop beefing! I love my INI EDO! On behalf of the entire internet, I hereby apologise to everyone who may have been traumatised as a result of trying to decipher Ini Edo's written response. Please forgive her. She wasn't being abusive in Chinese or any "strange" language. She's a Nollywood actress. English isn't her 1st, 2nd, 3rd, 4th, 5th, 6th, 7th, 8th or 9th language. She's fluent in Swahili. She schooled in Tanzania. On a serious note, Ini Edo did not rig any vote and neither did she or anyone acting on her behalf use any mischievous software, individusl or persons to manipulate or inflate her votes. 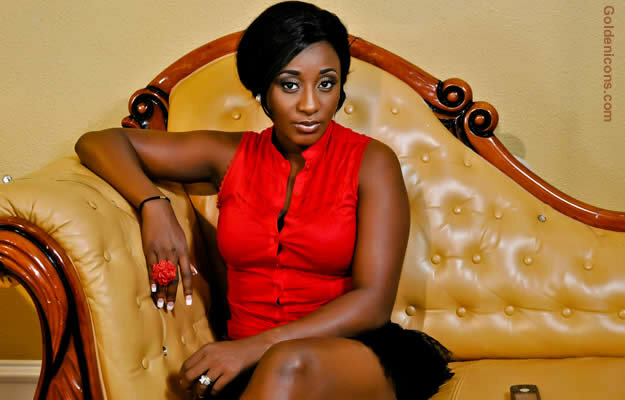 Ini Edo won - based on the high number of votes she received from across the globe from Nollywood fans - who voted for her. Now, how's that miraculous? The false, offensive, malicious, defamatory and damaging allegation (which was made by desperate, attention seeking, ignorant and wretched creatures stirring things up) will not be tolerated. It was a childish and failed attempt to smear Ini Edo's name and reputation. Back off. Back off. Back off. You have been warned. Short & simple, go girl u rule!!!!!!!! I don't think she is capable of hijacking a website considering she can't even spell twitter. And for the others saying it's a crime to have 6k votes..it's not the crime was to get those votes in less than 5 minutes while the whole month she just gathered 900 votes. @anon 9:38. Don't u make mistake sumtimes. Abeg free d babe joor. Anonymous 7.22pm you spoke my mind too. Most r annoying but rather than watch one Rita Dominic movie, lemme have ten of Ini. Rita that can't even change her hairstyle. I mean, what kinda face does one have that would restrict us viewers to same very look! And you get paid to be on that screen! Ini may not be all that but hello! Newsflash Rita, some of us prefer her! I'm still not gonna say ini didn't cheat how would I know? But those girls- Rita and Stella r just not it! Its GENNY nwa anyday and anytime *take it to bank people*.While the likes of Ini are rigging and complaining, Genny my girl is of to Dubai with two notable artists shooting an ad for...(Name witheld till released)in Dubai. The bigger people do bigger and better things. innocent until proven guilty. i think ini edo my name sake deserves an apology. if u accuse someone of cheating you so at least do so with proofs. hw dare u come on and say such malicious things about someone without substantiating ur claims. i wish ini edo wld sue for defamation of character or wateva oyinbo pple call it. Girl,i really love ini edo,so i don't know why celebrities wants to poison her name,well,it's not that big of a problem sha,because she's soaring higher,and is unstoppable too. nigeria latest entertainment news and gists. why short people too like wahala thats y they go tall cos of wickedness short engine this rita with her big mouth jealousy go kill you akpuda apruka leave my darling ini alone joor na werin sef she deserves it. ini i dont care about all these allegations...i just like u.
n hey babes, with ur very mature response to their tweets..way to go! Who's this idiot? @Sheikh? Ur not funny! As 4 stella, u go around being a nuisance and u talk n tink ppl will actually listen to u? Abeg yansh down. as for madame bleach face Rita! no one wants to kno wat u tink! U two shuld av cheated too nau.mschew!old fools makin noise! Ini sure told dem. Kheet Khat thank you!!! please tell them o! WHO BE KHEET KHAT (8:11PM)???? Ini's lawyer? fly on the wall? or Ini her self? all hater please hug the next transformer u come across, while, Rita, SDK please jump into the Ocean let the sharks feed on your flesh. am being nice now o!!! don't let us do it the hard way. i feel rita dominic and stella both over stepped their bounds by directing the tweets at ini edo,its so unprofessional of them. personally i cant blame ini edo because the lady is a busy person and hardworking too like others,its not like the poll has money attached to it,stella and rita should have acted better,haba!,i think thats objective enough. I think Ini and the rest should shut up, apart from Funke,uche,chioma and omotola who were busy annoying my timeline with their votes begging plus Genny and Lisa using their twitter church rats to beg when did Ini ask her fans to vote? The same day right? i wonder why people like rita dominic and that stella lady would go to that extent.im not canvassing for ini edo but im just saying people should just take it easy with her. WOW, Why are you fans so gauillible like thiS??? Its all PR.... that's all they ever too....if you knew the rubbish and nonsense all these people get up to, you wouldnt be screaming they are worth celebrating. They fight all the time, sleep around, do extra stuff for oney, None of them and i mean none is an angel. Name them, they are all liars. Big time kudos to her,she's so great,imagine her calmness when it comes to situation like this,it's really great,i do appreciate her guts. Hi there it's me, I am also visiting this website on a regular basis, this website is really fastidious and the users are actually sharing nice thoughts.